Me Time: In Closing | How Do You Do It? 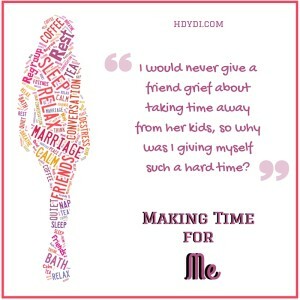 This week’s 22 posts on “me time” here on HDYDI, as well as those on the theme week link up, have shed light on the complexity of making time for the non-parenting parts of our lives. Some repeating motifs have become apparent. Nurturing ourselves is crucial, and it takes effort and planning when we have young children. MandyE, Krysta, Mari, Elizabeth, and SaraC all gave us practical ways to incorporate time for that nurture into our days in their excellent blog posts. Michelle gave us some pointers on the very basic, and surprisingly challenging, act of eating with two newborns to care for. Specific activities that keep us centred and connected to our spouses are key. I wrote about this, as did SarahN, Mercedes, SaraC, and Katie. Not every mother gets “me time” away from the children. Both Beth and Jen Wood wrote about this, as did I. Elizabeth brought a uniquely single parent perspective to this point. And SaraBeth found herself away from her kids in a completely unanticipated way. “Me time” changes over time, and the three of us with the oldest children in the group all pointed this out. MandyE and I wrote about how our use of me time has changed over the years, while Michelle noted that it hasn’t changed as much as some might expect. I found this week to be very enlightening, encouraging and uplifting. As a mother to young children, it can be difficult to see the forest through the trees. I really appreciated the wisdom from the more seasoned mothers. Thanks for linking all of these. I’ll need to check them out. I had to decide every Saturday morning would be my time for writing my blog and told my husband he’d be watching the boys then because if I didn’t plan it, it never happened. Such a great selection of posts… I have some catching up to do! Thankyou for all the inspiration though! Claire recently posted Mum Got Organised: Timetabling for busy mums! I found it easier to have me time when I had 1 but with 2 it’s a bit more tricky! I did manage to get my hair done last week which was 2 1/2 hours of bliss haha. helen gandy recently posted A Moment of Panic. Between being unwell, sleeping, parenting and working on the blog I hardly get any time for me. Your post reminds me that I really do need to take some time out now and again for moi! Anita Cleare recently posted How do I stop the nightly homework fights? Excellent series and lots of good advice. It’s easy to get so caught up with everything and everyone you forget to take care of yourself. What an incredible resource you have here! Pinning. Stopping by from Twinkly Tuesday. Having ‘me time’ is so important being a mummy is the hardest job I’ve ever done and it’s important to take care of yourself so you can continue being a good mum. Even if it’s just a soak in the bath when the kids are asleep or treating yourself to have your nails done. It all makes a big difference. Yes! Exactly! The other HDYDI MoMs and I were just talking about the irony of our blogging time not having come up in our discussions of nurturing ourselves. My husband is out tonight, and I am inspired – the yoga mat is coming out! 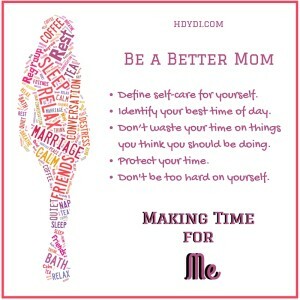 I think that’s the one piece of advice I can give to those who aren’t mothers yet….enjoy your “me” time because once you are married and have children it’s very limited. Great post and I will be sure to read a few of these. Thank you for hosting #TwinklyTuesday. Becky (@attwtwo) recently posted Must We Judge? ERFmama recently posted #Tipoftheday – Retrofitted ISOFIX!? “Me time” is so incredibly important for our emotional wellbeing and to help us ultimately be better parents. I really struggled with my identity after I had my son. I felt the old me had been ripped out from under me. Taking time for myself – going to work, seeing friends, writing etc – helped me to reconnect with the old Laura and get healthier. 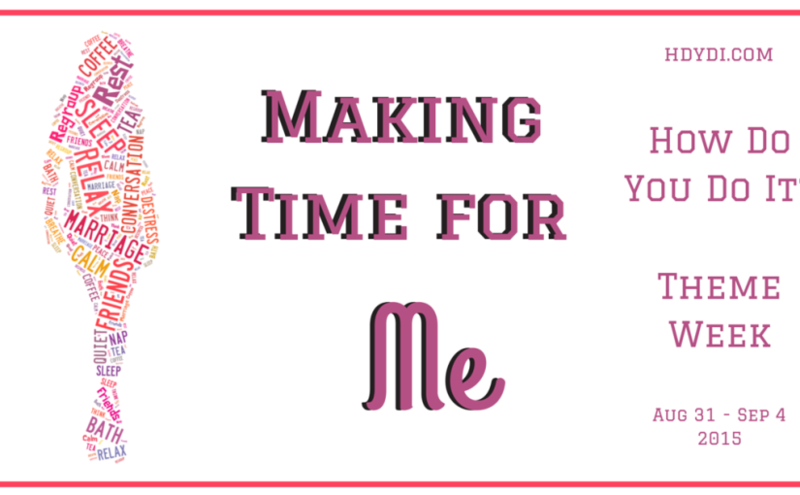 Me time is often hard to come by, if I’m not looking after my baby I’m blogging, then again, I guess blogging is my me time. It can be do hard to find me time but it has to be done every so often, for everyone’s sake. Thanks for the list of articles.